Microbial cells show a strong natural tendency to adhere to surfaces and to colonize them by forming complex communities called biofilms. In this growth mode, biofilm-forming cells encase themselves inside a dense matrix which efficiently protects them against antimicrobial agents and effectors of the immune system. Moreover, at the physiological level, biofilms contain a very heterogeneous cell population including metabolically inactive organisms and persisters, which are highly tolerant to antibiotics. The majority of human infectious diseases are caused by biofilm-forming microorganisms which are responsible for pathologies such as cystic fibrosis, infective endocarditis, pneumonia, wound infections, dental caries, infections of indwelling devices, etc. AMPs are well suited to combat biofilms because of their potent bactericidal activity of broad spectrum (including resting cells and persisters) and their ability to first penetrate and then to disorganize these structures. In addition, AMPs frequently synergize with antimicrobial compounds and were recently reported to repress the molecular pathways leading to biofilm formation. Finally, there is a very active research to develop AMP-containing coatings that can prevent biofilm formation by killing microbial cells on contact or by locally releasing their active principle. 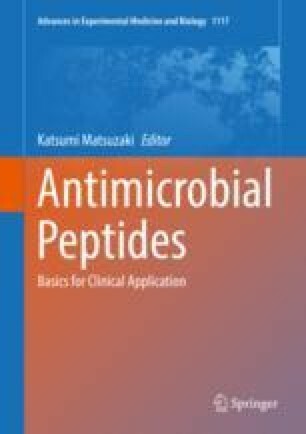 In this chapter we will describe these strategies and discuss the perspectives of the use of AMPs as anti-biofilm agents for human therapy and prophylaxis. This work was supported by the Proyectos de Investigación Universidad de Navarra, Spain (PIUNA-P2011-17 and P2015-14 to G. M. T.). R. F. E and S.B.V. are recipients of doctoral fellowships granted by Gobierno Vasco, Spain (BFI-2011-9) and Asociación de Amigos de la Universidad de Navarra (Spain), respectively. H.S. is grateful to financial support received from the Lebanese National Council for Scientific Research (CNRS) and by the Lebanese University.